Island Bay Presbyterian Congregation seeks to take the way of Jesus into the wider community. 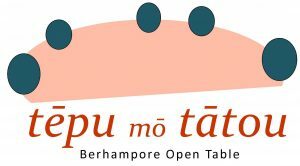 Tēpu mō Tātou (literally: table for us all) is our project in Berhampore. Its focus is food and the social housing communities. In 2016 we employed a Community Minister, Bruce Hamill, who works a team from the congregation to find ways of being with and supporting, and learning from those in the community, who, for many and complex reasons, are disadvantaged and know what it’s like to struggle against the odds. We work with tenants and City Council to open up the Community Room more often and build community life. We spend a lot of time at the flats supporting people in times of crisis. We provide funds for people to transition to vaporisers and reduce the cost of smokes. We share a soup lunch once a week in the Community Room (soup provided by the congregation, baking from BGI and a generous Wellington business). We support a tenant-lead Cooking Class. We support a tenant-lead ‘Fixery’ where residents get advice and tools to fix a range of everyday items. We have a team of volunteers who (supported by tenant leaders – Kaitiaki) bring Kaibosh (food that would otherwise be wasted) every Saturday evening and hold regular community barbecues to create a festive atmosphere in the flats (especially in the summer). 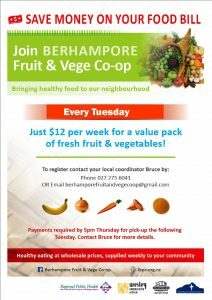 We’ve established a fresh food co-op in Berhampore in response to the fact that many people, affording transport to a market, on top of the cost of produce, is challenging. It happens every Tuesday. There are three pick-up points: Granville Flats (559 Adelaide Rd) from 11.30 till 1pm; Centennial Flats Community Centre (493 Adelaide Rd) from 1.30-3pm; and Rintoul St Flats Community Room (263 Rintoul St) from 4-6pm. Please register first. Orders can also be made online (and pre-paid) by 5pm on the Thursday prior to Tuesday’s collection. Banking details are on the registration form. 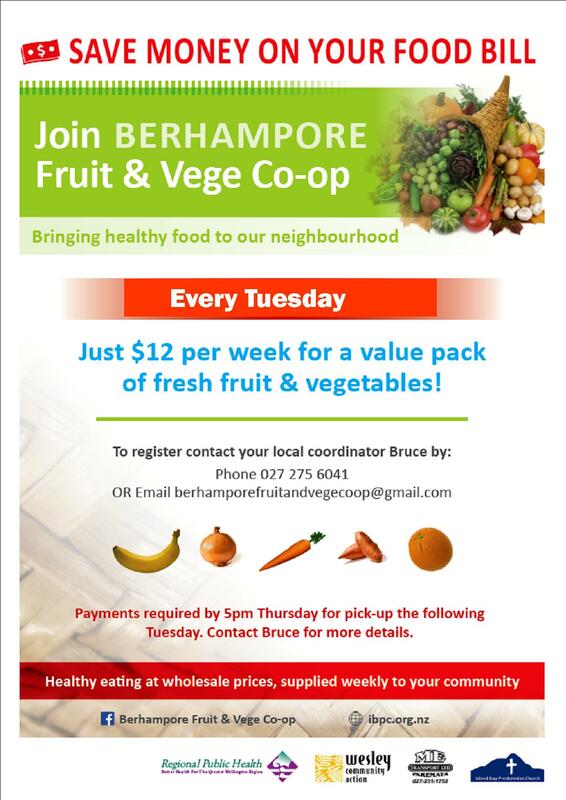 The Berhampore co-op is a branch of the Eastern Suburbs Fruit and Vege Co-op based in St Aidan’s Anglican Church, which is, in turn, a hub for a joint venture between Wesley Community Action, Regional Public Health and M.E. Transport Ltd.
Members of the congregation pack and transport the fruit and veges from Miramar to Berhampore. There, Bruce, Maria and the team take payments for the following week and give out ordered bags. Every so often the Co-op offers regular and free 8-week cooking courses (“Kai Confidence”). It is very popular! It aims to help those lacking confidence in cooking to build creativity in using the weekly order. Food is provided and everyone eats together afterwards. At Rintoul Street Flats tenants themselves deliver and distribute Kaibosh food. However, this is also a good time for the Community Minister to support the flat community. 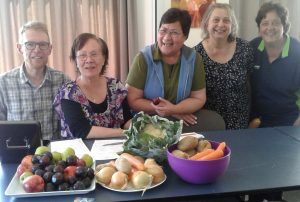 Regular contact is based around Kaibosh on Monday morning, the Fruit and Vege Coop delivery on Tuesday afternoon and other meetings in the community. At Rintoul Street we work closely with the Urban Vision Team in Berhampore. They are a team of people living in intentional community for the purpose of practising hospitality. They have already organised two very successful events for children and families. Along with them we are focused on finding ways to support children, youth and families in the social housing community. If you would like to be involved with us through the week, please contact Bruce Hamill at 027 2756041.